Our lives are filled with numerous choices. Some choices are small (like what we will have for breakfast) and some are big (like deciding who to marry). 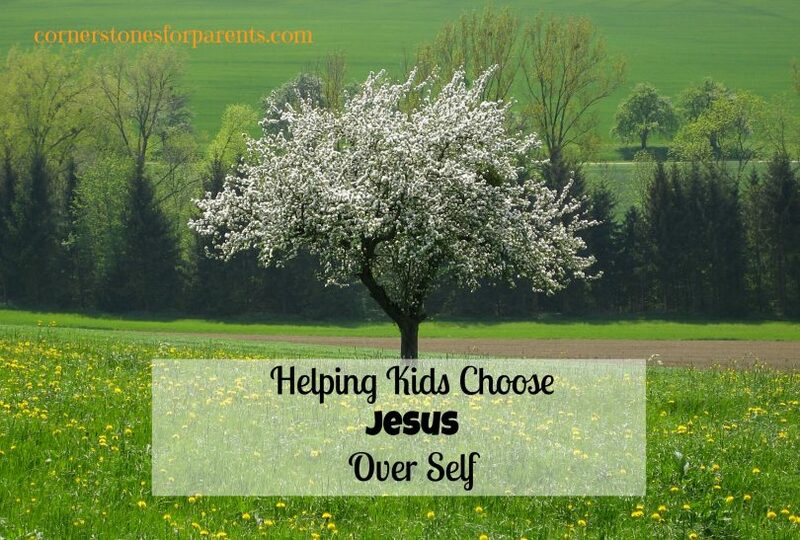 But the most important choice of all is choosing Jesus over self. Today’s parenting truth comes from Genesis 3 where we learn how choice was introduced into the world. We can use this passage to teach our children that they have a choice to follow Jesus every day. In the beginning God . . . This is how it all began. God created everything. From the tiniest tadpole in the smallest brook to the massive ice cap on the tallest mountain – it was all made by God. And it was good. Center stage in this good creation was a beautiful garden. And in that garden there were two very special trees: The Tree of Life and The Tree of the Knowledge of Good and Evil. Ah! That second tree . . . that second tree was a wonderful tree. A lovely tree. A tempting tree. It had delicious fruit on it and it was beautiful to behold. But God made a rule about this tree: don’t eat of it or you will surely die. You can eat of any other tree you wish. But not this tree. This rule gave people a choice: you can choose my way or your way. Which will it be? Well, Adam and Eve chose their own way and the face of the planet and everything on it changed in an instant. But because God is great and merciful, He removed them from that beautiful garden so that they would not eat from the Tree of Life and live forever in their self-chosen, sinful state. He loved them too much to let them live like that forever. In fact, He loved them so much that He made a promise: There would one day be a Way out of the mess that they made. This second Tree of Life is the way to eternal life with God . . . and as we look upon it, we have a choice to make. God gives us the gift of choice. Without choice, love is not love. Choice gives us the chance to show God if we love Him more than ourselves. Adam and Eve’s choice showed who they loved more. When we choose to put Jesus first, before ourselves, we show that we love Him. Matthew 12:34 says something really important: “Your words show what is in your hearts.” When we put Jesus first, it shows in how we respond, speak and act. Have your children sketch, sculpt or paint a fruit tree. Glue two small twigs (or Popsicle sticks) into the shape of a cross. Have your children attach the cross to their tree so that the vertical stick runs up the trunk of the tree. Place their creatione somewhere as a reminder of the choice they have – every day – to follow Jesus or self.